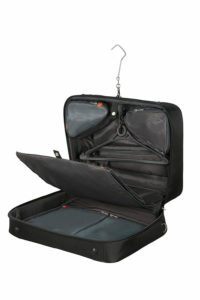 Garment bags aren’t as well used as their commonly used counterpart, the carry-on. However for some people they are a travel essential. If you’re one for travelling light, you may want to consider a garment bag. They are perfect for a business trip or a few days away, and help to keep your clothes relatively crease free and easily hung when you arrive at your destination. Ideal for carrying suits or formal wear, a garment bag allows you to transport your clothes easily and almost completely wrinkle free. No one wants to turn up at a business meeting with a creased suit now do they? 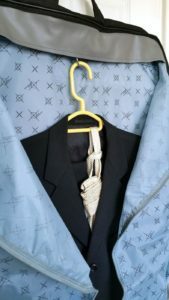 Usually when travelling you won’t have the time to iron your shirts and such, so the garment bag could be an excellent investment for you. Of course you still have to iron them before you travel! There are a lot of options out there for the garment bag. With loads of respected brands now making garment bags, you’re going to have a lot of choice. If you choose the right one, you’re going to have access to loads of storage space! Usually in the actual inner garment tube you can fit a couple of shirts and 2 suits. Plus the additional pockets to carry essentials like toiletries and underwear. Seeing as one of the main purposes of a garment bag is to keep nice clothes in good condition, its pretty essential that the materials are super high quality to ensure the clothes stay pristine! So you can be pretty sure in the fact that these garment bags will last a long time. So, whether you’re travelling via airports, train stations, or just carrying them on the street, these garment bags will provide you with ultimate ease when transporting. Some bags can even be slung over the shoulder easily. Choosing the right garment bag will give you peace of mind when you travel, knowing your belongings are safe and secure, and also make your trip just that little bit easier! So, make sure you choose the right one! I’ve never had a bad experience with Samsonite (CHECK PRICE NOW!). I’ve actually still got a suitcase by them that my mum gave me ten years ago, that she bought ten years before that, and its still in perfect condition. Samsonite is undeniably one of the leaders in the luggage industry. They’re cases are perfectly functional, built to last, and effortlessly stylish. This gorgeous garment bag from Samsonite really looks the part. It’s a classic jet black, and made from 400 x 400 denier twisted nylon and 450 denier twister 2 tone polyester and polyurethane. Not only is it lightweight and super durable, but waterproof as well. So you don’t have to worry about carrying this bag about in the rain, and if you do get caught in the rain, you could just pop it over your head to keep yourself dry! The shoulder strap is adjustable so you can carry it however suits you. It is also ergonomic, so made to be ultra comfortable and mould to your shoulder, and also removable! So you can carry the bag any way you like! It also has a hook, so you can hang your garment sleeve over any door or hook for easy access and to keep your garments hung up nicely. It has plenty of little compartments aside from the main garment sleeve, so you can keep your clothes separate, and your accessories and any other little bits all organised and tidy. It is cabin luggage size approved on all UK airlines, so avoid getting hit by additional fees at the airport. And at an astonishing 1.8kg this bag is really lightweight, so you can avoid lugging around any extra weight with you. It also has a built in TSA approved lock, so you can travel in peace, knowing your items are locked away and secure. Overall I would say that this is really an excellent garment bag, whether you need it for business or pleasure, this bag will suit you. Its so perfectly functional and everything has been thought of. Its really spacious and allows you to pack alot, and the bag still feels pretty light. The material is no doubt extremely high quality, and looks amazing. You really can’t go wrong with a Samsonite, and although not the most expensive in the range, it may seem like a lot of money to spend. But I assure you this nifty little garment bag is worth every penny. I would say that I was blown away by the impeccable quality, but its absolutely expected with such a great brand like Samsonite. So well done there, you have not let yourselves down! This garment bag is at the much cheaper end of the price range. Clearly a bargain, I wanted to see how much, if at all, it was going to compromise on quality. I hadn’t head much about this particular brand before but was excited to try it out. Perhaps I had found a new favourite that could be saving me a lot of money in the future! From first impressions, it felt really nice. Its made from a nice material and feels super light, but really flexible as well. The outer is hard wearing, high quality, 600 denier polyester. It looks smart and the sheer black is really cool. 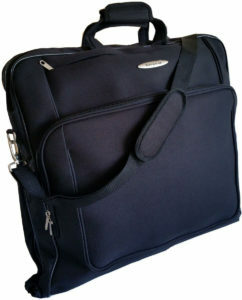 Its really lightweight which is perfect for a garment bag, because the lack of wheels means it is always being carried. So at only 1.2kg this is really impressively light. It is regulation carry on size, of course, so no need to worry there. And with the capacity of carrying a good couple of shirts and a suit or two, you can really travel with ease with this bag. There are also plenty of practical zippered pockets to store and secure your other valuables, including a cool long accessories pocket for ties or jewellery. It is separated into two compartments, one larger for the clothes, and another pretty perfect for documents, and valuables. This bag is remarkably practical. It folds right in half for easy transport, and has a super comfy padded shoulder strap which is removable if you need to, and has dual padded handles for extra comfort. The lining is fully lined with a luxurious silky material, and the zippers are strong and heavy duty, so you can be assured the zippers aren’t going to come off in your hand, as I have experienced with some cheaper luggages. It also features a hanging hook and fasteners. Dual padded handles – for comfort when carrying, especially long distances by hand. Large strong lockable zippers – super strong so you can rely on these zippers being durable, and easily lockable with a small lock. Overall I would say that this case served its purpose excellently. Its not all singing and dancing, with bells and whistles, as you may have with higher priced garment bags, but you don’t need it. 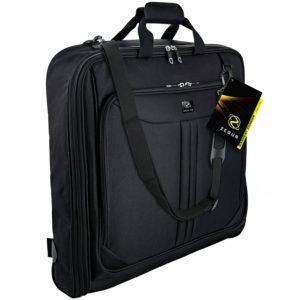 This garment bag is practical and smart, and did its job in protecting my garments excellently. I would say that this is definitely worth the money, and then some. It doesn’t feel cheap, which I was expecting with a bag at this price. I’m yet to test the durability over time but for the two trips it has been on, its held up excellently. 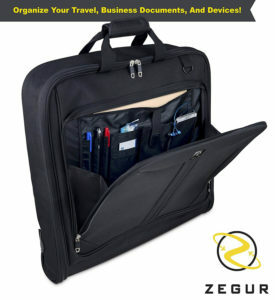 I would definitely recommend this garment bag for any business man or jet setter out there. I found this fantastic garment bag online at a really good price, again I wasn’t so sure on the brand, but the RRP was pretty high so I was expecting good things. So, the bag arrives, and I must say, first impressions are great. It feels pretty light and the material feels great. Its made from 1800D polyester, which is super thick and durable, a little stronger than the Lorenz. This bag is guaranteed to be fully waterproof and fray resistant, which is amazing. What I love about this garment bag is the attention to detail. They’ve really put the little extra effort in to make the bag really practical. My favourite feature is the interior dual buckle, which held my garments in place perfectly, they came out of the trip with not a single crease. And who has time to do their ironing when they’re travelling?! More time to relax, less time worrying! Again we have a detachable shoulder strap, which is padded and adjustable for extra comfort, with soft padded handles as well. This garment bag is also well within the carry on restrictions on any airline, so you know you won’t get stung with any check in charges! When your luggage is practical, it takes a lot of the stress out of the annoying task of packing and travelling. With the garment bag you really know where you’ve put everything, there are multiple zipped pockets, maximising the capacity. The exterior pocket is perfect for travel documents, and valuables that you need to keep handy while you travel. The lining is an elegantly printed silky material, which adds that little finishing finesse onto this bag. I think this is an excellent bag. It features everything you need from a garment bag, and my clothes came out of transit in perfect condition, ready to wear, which is great. I do feel that I lost the couple of centimetres in the capacity though. I like the knowledge that there is a money back guarantee, meaning the company has faith in its own products, which gives me faith in their products too! I would be hesitant to buy this particular bag at its full price though, as I feel it was a little expensive for what it is, at the price I found it at however I would definitely recommend it. Perhaps a little predictable, but I’m going to have to go with the Samsonite garment bag as the leader in the field. Although at the more expensive end of the range, the quality is just unfaltering. I was really impressed at the value for money with the other bags, but for me I would rather spend a little extra for the added details and functions that come with the Samsonite. It really made my trips so easy, and I would say was the perfect companion for my frequent business trips.